We don’t often do things involving video games here at ConTessa, but the Venn diagrams of our two worlds have a lot of overlap, so when Holidays came to us to let us know about this upcoming Twitch marathon on Valentine’s Day for a trans youth organization that helped her out when she needed it, we thought you might like to hear about it! Inspired by Hbomberguy’s stream to raise funds for the Mermaids charity in the UK, Twitch streamer Holidays and friends are putting on a fundraising stream for RECLAIM of Minnesota. They’ll be playing through seven(!) 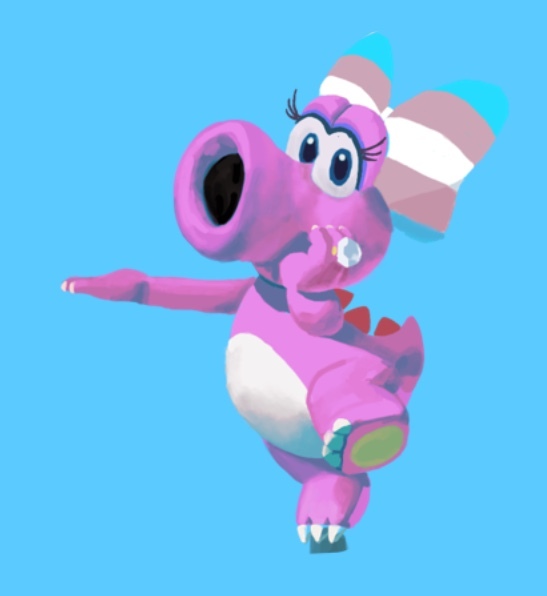 Mario games in honor of trans video game star Birdo. At RECLAIM, we work to provide financially and culturally accessible care to queer and trans youth and their families, as well as continue to train practitioners and partner in community to create systems of change at the intersection of gender and racial justice. You can support Holidays and her marathon Mario’ing crew by tuning into her Twitch channel and signing onto her Discord server on Valentine’s Day (Thursday! ), starting at 5PM CST. Follow her on Twitter for a countdown and more information, and have a brick-smashingly good time!